Though Link fulfilled the Hylian prophecy of the Legendary Hero and destroyed the evil tyrant Ganon, the land of Hyrule enjoyed only a precarious peace. The restless people knitted their brows and shook their heads wondering what threats would arise from Ganons ashes. Ever vigilant, Link decided to journey away from Hyrule on a quest for enlightenment, in search of wisdom that would make him better able to withstand the next threat to his homeland. Months of difficult travel passed. After a long and fruitful voyage, Link breathed deeply the sea spray from the deck of the ship that carried him home to Hyrule. But his homecoming was not to be. Suddenly a squall struck Links ship, and though he valiantly fought the waves, a lightning bolt reduced his ship to splinters. The world faded black, in front of Links eyes, as he sank into the darkness of the storm-tossed sea with the remains of his craft. But in the cold darkness of the deep, Link heard a comforting voice that reminded him of home. It was the voice of Princess Zelda! The voice cheered as Link woke up and opening his eyes he found Princess Zelda standing over him. Or was she? Her ears were rounded! Actually, it turned out to be a girl named Marin. 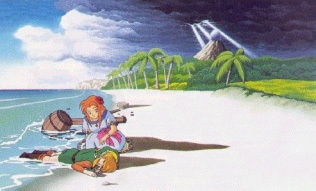 She explained that Link had drifted with the wreckage of his ship to the shores of Koholint Island. The mysterious island was unique for the gigantic egg which crowned its central mountain. It was said that a mythical creature, the Wind Fish, lied asleep inside the egg. The girls father, Tarin, returned Links shield to him but the rest of his equipment was missing. The hero then set out to search for it, see if anything else had washed up on the beach with him; and on the way he met the people with round ears of Mabe village whom amazingly seemed to be completely unaware of the existence of other lands beside their small island. 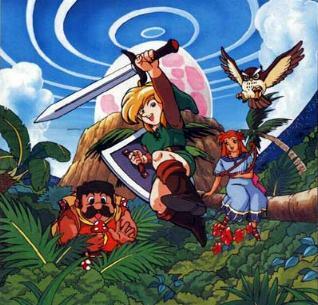 As Link reached for his sword on the beach, a strange owl suddenly appeared and started talking to him. He said that, because of Links arrival, the monsters started to act more violently as it was foretold that a courageous lad would come to wake the Wind Fish; then the owl suggested to head north to the forest and left. While wondering about what the relief meant, Link met the owl again. He knew what the lad had read, and said that no one knew the nature of the island for sure except the Wind Fish himself. Link continued his quest, and as he found the sixth instrument the owl appeared again to warn the lad: the monsters were now intently trying to stop him as they were afraid of what the Wind Fish's awakening could result in. Dream or not they would soon conquer the island if nothing was done; so with renewed hurry Link headed to the next two dungeons. The last one caused unpleasant memories to the Legendary Hero as it was no other than the Turtle Rock; but how could it, as well as the Spectacle Rock be on Koholint? Was it all really a dream? 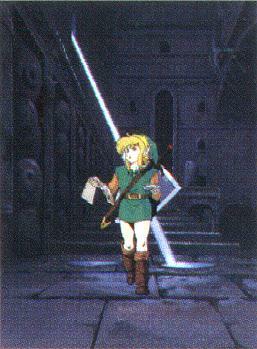 Link summoned all his courage and managed to retrieve the last instrument. With sadness he visited Mabe village one last time and then climbed up Tamaranch Mountain to reach the Wind Fishs egg. Upon suggestion of the owl, the Legendary Hero played the Ballad of the Wind Fish in front of the egg, and a part of it was crushed allowing the lad to enter it. Inside Link found an unusual maze but thanks to the knowledge he obtained at Mabes library he was able to reach its end and there he found the greatest nightmare. Death Eye, the dark matter creature, said that their plan ruined by Link, was indeed to rule this world by making the Wind Fish sleep endlessly so that the island wouldnt disappear and desperately attacked him. The monster took many forms, even those of Agahnim and Ganon! But Link knew their weak points and fought back; so the nightmare took a new form, the one that was this nightmar's namesake, that of a monster from the past that the Legendary Hero had never met. And when the nightmare was finally destroyed a mysterious voice invited him to climb a ladder that just appeared in front of his eyes. Over bizarre clouds and the stars Link reached the top and found the owl, that was a part of the Wind Fishs spirit: the guardian of his dream world. He told the Hero of how the nightmares had invaded the dream, and thanked him before disappearing as his work was now done. Then the Wind Fish appeared. His appearance was that of a whale covered by what looked like large runed carpets and beautiful gems, with tiny birdlike wings. He emitted a sound peculiar to whales, introducing himself; then told Link about his dreams describing Koholint, and was sad as this whole world was about to disappear with his awakening. The Wind Fish was an omniscient creature and that explained why so many things known to Link where in his dream as well as the strangest ones. He asked Link to play the song of awakening so they both could awake. And finally he woke up on a piece of his ship. He wondered about his experience while the sea seemed to mimick the Ballad of the Wind Fish and Marin's voice. Was it just a dream he himself had? Then suddenly the sun was covered, Link looked up and saw the Wind Fish flying away, finally free.